Thanks for considering ‘Punch The Air’ for your corporate event band. We’ve performed for some pretty huge and well known companies at some massive venues over the years we’ve been together. We’ve also performed for smaller companies in tiny venues too and no matter what, everyone always has a brilliant time with us. Our previous clients include BBC, Pepsi Co, Lexus, Halifax, Rotary International, South Staffs Water and Sharpie to name just a few. 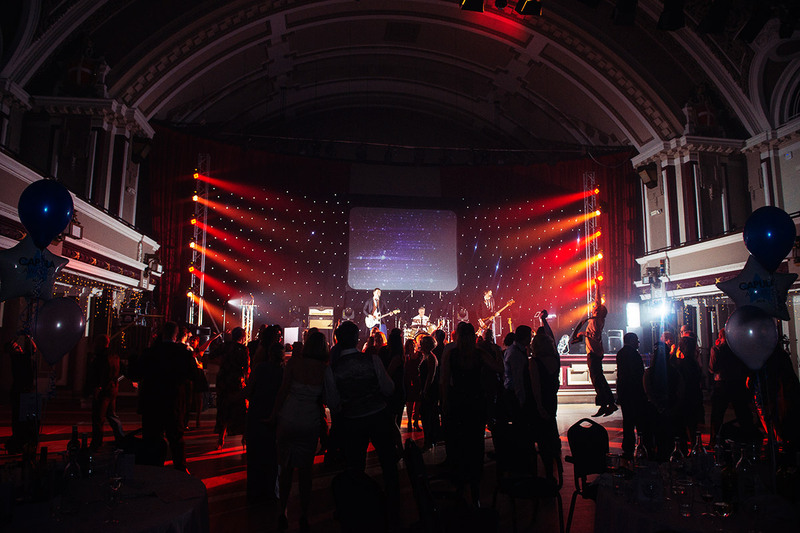 We’ve performed at many prestigious venues such as Stoke Town Hall, Wolverhampton Civic Hall and Birmingham Town Hall. Please watch the corporate event video we produced for South Staffs Water & Water Aid below. It’ll give you a great idea of the way guests react to our live performances and the type of music we play. You can view many more videos of us here. What kind of music will we perform at your corporate event? You’ll have lots of different aged employees at your company and all of them will have different tastes in music. 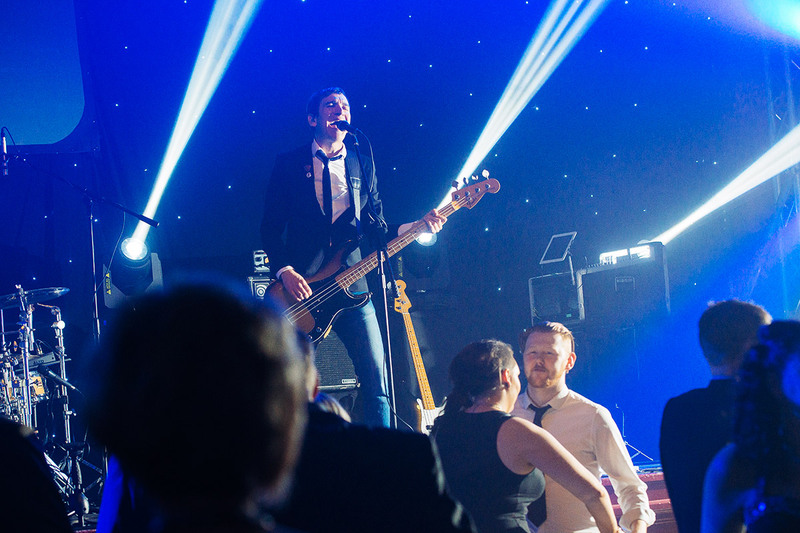 ‘Punch The Air’ believe that all your hard working staff should be able to enjoy themselves all night long which is why we perform “Something for everyone” styled live sets. We’ll play a fantastic range of very well known music from present day all the back to the 1950s in a pop/rock style by bands like The Killers, Queen, Amy Winehouse, The Beatles and Oasis. We don’t play anything too obscure, too loud or too heavy so everyone can enjoy our performances. You can view our full repertoire here. 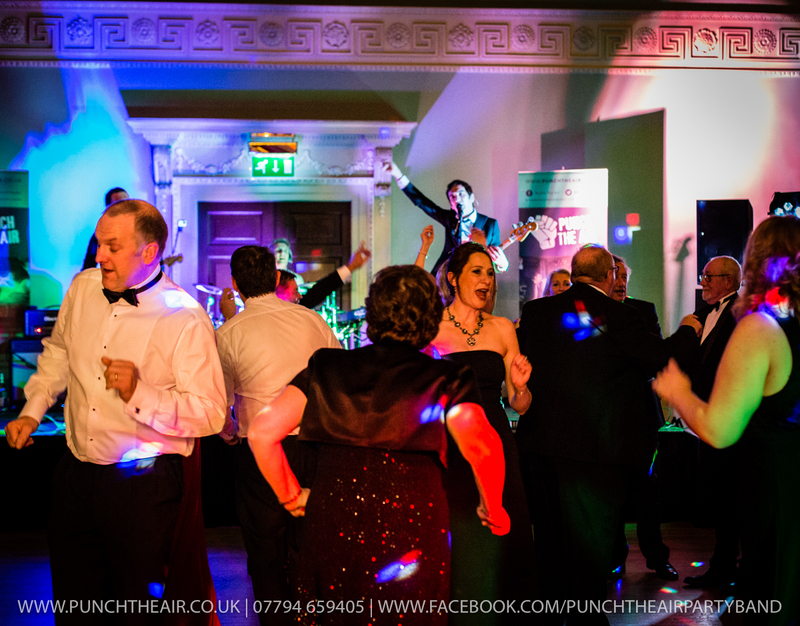 Whats included when you book ‘Punch The Air’ as your corporate event band? 2 x 45 minutes of live, upbeat performances (Plus encores). A very competitive price that you’ll find hard to beat. * Under some circumstances events booked at large venues may require an additional fee paying for a larger PA system and lighting to be installed. We can either quote you for this or you can book it separately yourself. Depending on where your venue is and what time the band need to arrive and be finished by can affect the fee charged. Many clients require us to be fully set up and sound-checked much earlier in the day before guests arrive or sit down for meals. Please remember to include as much information as possible in the contact form below so we can quote you accurately. Late night DJ services (Past midnight). Acoustic performances (Solo/Duo/Trio) when your employees start to arrive at the event or instead of the full live electric band. Customised projector lighting featuring your corporate branding. PA and microphone hire for your speeches. Professional photographer for your event. You can read many wonderful Testimonials from previous corporate events that we have performed at here. We think a band should have to prove how often they are out performing. If you’d like to see just how active we really are please visit our Facebook page here where you can pictures, videos and comments from all our latest performances.